A long time ago the teenage Uroš decided that he wanted to climb mountains above all else. He bought new boots, a map, and a guidebook. Choosing a mountain from the book, he hitchhiked to its base, hoping the driver will know how to get there. At the time, finding the mountain seemed more difficult than climbing it. He still doesn’t know what precisely precipitated that sudden desire to be in the mountains, but it changed his life. After ascending that first mountain he never really descended and whenever we call him on his cell we first ask: “Are you in the mountains?” Most often he is. When he descends we have to look for him either on the bike or in a quiet corner where he is indulging in his greatest addiction: reading. Since reading, cycling and mountaineering don’t pay in and of themselves he started writing about it for magazines, as well as writing and producing TV shows. He hosted a documentary series about crisscrossing Slovenia – on a mountain bike, of course. Out of it came the guidebook “Cycling Slovenia”, which records his 2000-mile long bike journey through his tiny motherland. There was another fateful decision he made without really knowing why: cycling through Tibet. Again he first had to find Tibet on the map. And again he never really came back. Trekking, cycling, and mountaineering in the Himalayas became a way of life and also a job once he started guiding for TrekTrek. He is one of those lucky people who don’t distinguish between their work and their free time. 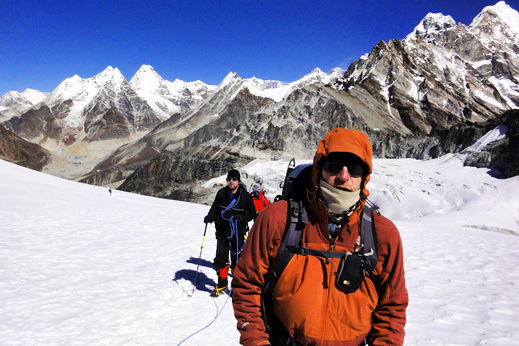 After trekking with a few groups his favorite holiday would be to do some more trekking (for as long as possible). Or bike packing. Or ski mountaineering. But never without a book or three. He would sooner forget to pack a spare tire than his Kindle. If you are looking for a guy with an incredible amount of experience (after all those years of travel! ), a laid-back attitude (lack of a stressful life! ), a wide-ranging knowledge (having read so many books!) and a bottomless appetite for food and wine (after all those burned calories! ), you don’t have to look any further – but good luck finding him.